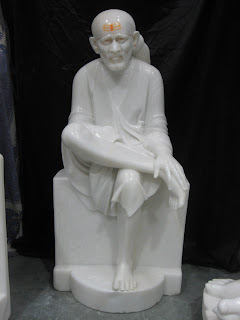 Recently, i received a email from a Shri Sai Baba devotee, with pictures of Sai Baba idol. The devotee wanted to donate the marble statue of Sai Baba to a Temple, were Sai Baba’s idol would be loved and worshiped. Numerous devotees deriving benefit from the same. I looked at the pictures and the statue in those pictures, looked amazingly alive. Since long i had wanted to write an article, which would be helpful as a guide for devotees building a temple of Shirdi Sai Baba and requiring a Sai Baba idol for Sai Baba’s worship. The thought of writing the same came, when a devotee friend of mine wished to donate a Lord Duttatreya idol to a Shirdi Sai Baba temple. He wanted to donate the idol with the best marble and best craftsmen. For this he made number of trips to Jaipur, where the best craftsmen of marble idol are found, and also the best deals, as there are no traders in between you and the manufacturer. So i thought of putting his experience as a guide to those who would want to buy a good Sai Baba idol, directly from the manufacturer or the artist. If you are looking for a huge and good statue of Sai Baba for a temple, it would be best if a person makes few visits to the manufacturer. Firstly for selecting the good marble, then few more visits while the idol is being carved out, to see if it is being made according to your satisfaction, really helps. All the idols in this post are of the idol lovingly carved by Naresh Bhardwaraj. The title of the blog post does not seem to go with this blog post or the article. No! It is! (Ok initially the title was - "Give me the real Gold" But later it's changed with a suitable one. Since i forwarded the two Sai Baba idol manufacturers or craftsmen’s details to the devotee. Pictures of Baba’s idol from both of them were sent to me along with the prices for guidance. I have a small Sai Baba idol about 5”, which i had bought from Shirdi. It might have cost about Indian Rupees 200/-. 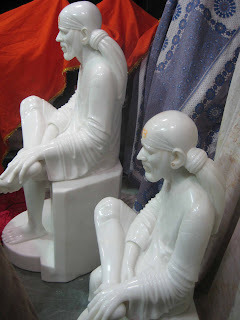 Marble powder molded idols available in many shops in Shirdi. This idol is in the home’s puja room. Once a desire arose in the heart to place a bigger and more beautiful idol of Baba in Puja room for worship. I called the devotee friend, who had roamed about in Jaipur and other places looking for best idol. Talked with him, about my desire just before sleeping, and that i would require his help for the same. Talked about the cost of idol of Shri Sai which was in some thousands of Indian Rupees. It was not a matter as it could have comfortably been paid. Naturally, the plan for another better(? ) idol ended there. We have seen this in Intense love is what Sai Baba or God needs. Sai Baba’s love for garland and prasad from poor old women devotee. Baba loved, appreciated and accepted prasad from these devotees leaving aside other gifts and prasad, which would seem far more better to our gross eyes and taste. It was and is, a lesson to us that intense love matters the most. Offerings with love, whether they appeal to gross eyes or not, whether they have any value in material world or not, it does not matter. What matters is love towards Guru, a thankful heart towards Guru, a surrendered heart towards Guru, a heart, full of reverence. i was also put a very tough job of selecting a Sai Baba statue from few. This is very tough part. The mind can say that this looks good to the gross eyes. For heart, any idol of Baba or picture is as beautiful. The heart gets filled with love and joy. The head bows in reverence, the moment it sees any idol or picture of Baba. It may be an old picture with maybe tore borders and wrinkles on it. It does not make any difference to the heart. The one sitting on the throne is more important than the throne itself.